In my part of the world we don’t often see snow before Christmas; but this year it is being delivered early and often. Nothing transforms the winter landscape of dead leaves littering brown lawns, barren grey trees, dirty sidewalks and sunless skies like a good, thick, sparkling, fair layer of snow. In that moment before you curse all the ways that it will impede your commute to the office, the silent, white, weightless, arrival stirs our hearts with the wonder of snowmen, sledding, hot chocolate and days without schedules. It makes everything seem new to look out your window in the morning and find the world in a blanket of pure winter. 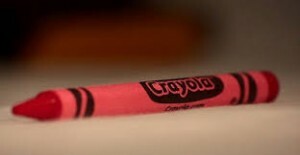 I read in a book (The Last Lecture by Randy Pausch) recently that we adults should carry a crayon in our pocket and smell it occasionally to encourage our childlike spirit of curiosity and creativity and to reawaken our passion. I thought it was a wonderful idea until I left a lone red crayon (my inspiration for a day of teaching and writing) in a forgotten pocket and tossed it unwittingly in the hamper. It ruined a couple of my favorite shirts and my momentary inspiration was instantly transformed to complete irritation. Pausch laments that most of us grow into adulthood devoid of wonder and curiosity.